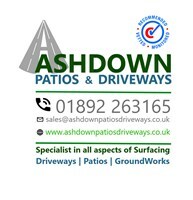 Ashdown Patios And Driveways - Driveways/Patios/Paths based in Crowborough, East Sussex. Driveways Surfacing & Patios Specialist - Ground Work Contractors. Our work is carried out by our highly experienced professional, friendly, reliable and highly skilled craftsmen. With years of experience to complete your project to the highest standards. Ashdown Patios & Driveways is driven for customer satisfaction. We believe a job is not just to profit money, but to profit our clients by Providing them the best workmanship & customer service we can provide for their project. Creating your vision for your home/project a reality! Ashdown Patios & Driveways pride ourselves in providing high quality, affordable Patio & Driveway, Hard Landscaping and ground works solutions to our customers. We believe that Keeping good communications with our clients through out the project is key to a successful Project. We our all about quality of works and providing our best customer satisfaction always! Whatever your Driveway or Patio needs, our friendly, reliable team are here to help! We offer honest advice as well as a free quote.